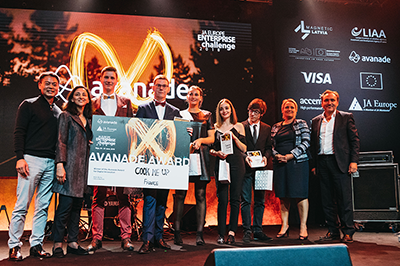 Avanade has collaborated with JA Europe since 2016, supporting the Start-Up programme in Brazil, Italy, Norway, Spain and Sweden. As the leading digital innovator on the Microsoft ecosystem, Avanade’s team of 35,000 professionals pride themselves on bringing bold, fresh, innovative thinking to their clients and Avanade is delighted to once again sponsor the Digital Innovation Signature Award. The award recognises young entrepreneurs who showcase a digitally innovative mindset as they conceive their business idea or concept. The teams will be judged by senior leaders from Avanade who will assess each business in terms of its viability and feasibility, sustainability, digital ethics, and the team’s presentation and soft skills. The start-ups will also be judged on how they leverage digital tech innovations such as mobility, collaboration tools, cloud-based technology, machine learning, artificial intelligence, Internet of Things (IoT) and blockchain, in their products or services. To support the students during the application process, Avanade will run two online webinars, in which they will talk through new digital technologies and their recommended approaches towards design thinking, digital transformation and data and artificial intelligence. Avanade will also run a Digital Clinic, offering students interactive sessions with digital experts, in which they can talk specifically about the challenges they are facing within their start-up businesses and how digital technologies can be used to solve them. In addition to a cash prize of 1000 Euros, the winners will also be invited to meet and discuss their ideas and their experiences with the Avanade team at their London offices. The winning team will also be offered one-to-one mentoring and coaching from Avanade, and invited to select Avanade activities and events. Avanade is the leading provider of innovative digital and cloud services, business solutions and design-led experiences delivered through the power of people and the Microsoft ecosystem. Our professionals bring bold, fresh thinking combined with technology, business and industry expertise to help fuel transformation and growth for our clients and their customers. Avanade has 35,000 digitally connected people across 24 countries, bringing clients the best thinking through a collaborative culture that honours diversity and reflects the communities in which we operate. Majority owned by Accenture, Avanade was founded in 2000 by Accenture LLP and Microsoft Corporation.